All content defaults to the left and ignores centre setting? Firstly, I am not a professional designer so please excuse any silly questions. I am familiar with using WPBakery and am trying to input the content for our opening page. I have downloaded the Integrity 9 demo content as the basis. As you can see from the image, the content defaults 'flush' to the left even though I have the titles set to 'centre' alignment. Also any new content put it again sits flush to the left border and their is no apparent options to alter this such as create borders. Am I missing something? I purchased the theme as it seemed to be quite simple and ideal for someone with my low level of experience. I hope you can assist me with my enquiry. Thanks for writing in! If you are using the default page templates, this should not have happen. If you are already using it, maybe you have added a custom css or another plugin or code may have caused this issue. I have checked your site and it seems that it is under in construction mode. To assist you better with this issue, would you mind providing us the url of your site with login credentials so we can take a closer look? I have imported the demo content once again and am trying to edit the home page using WP Bakery page builder. I did this to see if it made any difference. If I try to add any element to the demo page using the visual WP Bakery Pro, such as a piece of text, it defaults flush to the left (full width) and will not allow me to centre the text. If I go into the backend editor (which I am familiar with) then it's even stranger as their is nothing to edit? Please see the image attached. I followed the set-up and installation process to the letter and am finding this theme very difficult to use. All of this is using the demo content from 'Integrity 9'. I cannot understand why this is happening, I would be grateful if you would log into the site using the details above and see if the problems I am having above are my fault or something else is causing this to happen. The problem you are experiencing is because the demo content is not created with WP Bakery Page Builder. It is built with the Cornerstone which is the default Page Builder of the Theme. You will need to make sure that the Cornerstone plugin is installed. To do that you need to just go to X > Validate menu item and wait for a few seconds and then go to Plugins menu and make sure that the Cornerstone is activated. Then you will have an option to edit the page with the Cornerstone. You can always use the WP Bakery to add new pages but you can not use it for the demo pages as those are created with Cornerstone. Now that I have had the time to experiment with the theme, I must say that it is incredible. I realise that I had a slow start, but now that I understand more about how the theme operates, it is far and away the most feature rich template I have ever tried. I am 90% of the way into the creation of new website and do have a couple of questions which I hope you can help me with. 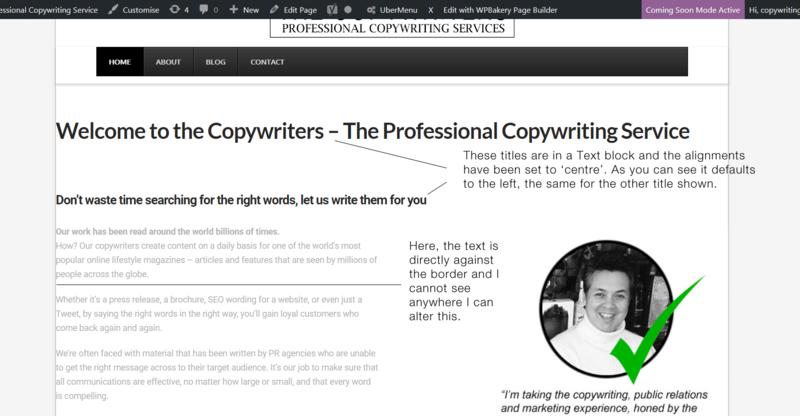 To get the right look on a desktop or laptop screen, I have used a large font size for headings. When I preview the site in mobile phone mode, the font appears overly large. Is there a setting or some .css code I can put in which stops this from happening? e.g. shows the font in a smaller size on a small device. As you can see from the image, I have a large white space at the top of the content on each page, this is shown on the attached image with a red 'X'. This spacing appears on all of the pages. I do not want to completely remove the white space but perhaps would like it 30% smaller. I cannot find an obvious option for this. If you know of a way I would be very grateful. That's about it for the moment, thank you again for the excellent support and a fantastic theme. Glad that you managed to pass the learning curve. The first part of the code is for the spacing at the top inside the frame. And the second part is the spacing at the top outside the frame. Now please play with 30px on both sections of the code to find the best match for your case. Thank you very much for the advice and guides. I will try these out and will open a new thread if I need further support.